We're always dreaming of lazy Summer days, the sand between our toes and a drawer full of new swimwear to match any mood. From fresh tropical prints to colour blocked classics, soaking up the sun in our swimwear has never been so good. It's time to start making a splash with Roxy swim clothing. Roxy brings you the latest swim styles, prints and colour patterns. From floral print one piece swim suits to front zip bikini tops. Our latest swimwear range suits your every need for lazy summer breaks, keeping active or casual wear out of the water. Pop Surf is one such collection designed for the modern active woman, in or out of the water. Dive into the collection and find your perfect one piece, bikini, tankini, separate or wetsuit. 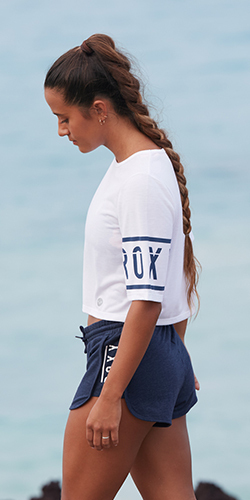 Roxy swim pieces use the latest technology and innovations like quick dry recycled fabrication, shoulder zips and many more. All of the materials are of high quality while designs use the perfect mix of bold fashion and surf function.